This badge makes us laugh everytime we make it. 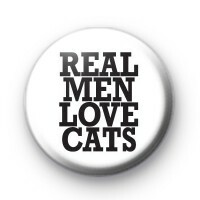 It is a white badge with black text that says 'Real Men Love Cats' we 100% agree. Men can be crazy about their cat too & we think they should be. We have lots of fun cat and pet-themed badges in the shop so make sure you check them out too.